Kozhikode: Protests are brewing against the continuing arrest of human rights activists in Kerala on the charge of suspected Maoist links. 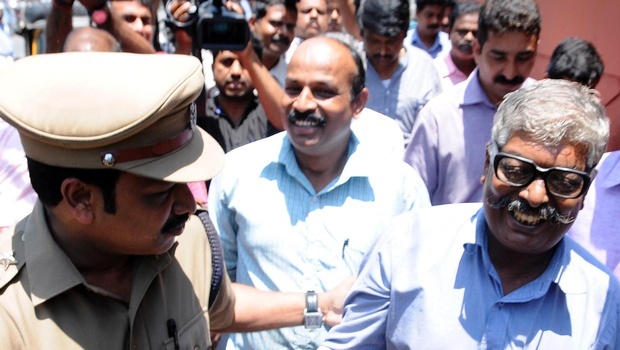 Notable activists in the state urged the state government to take stringent action to release the activists of Revolutionary Democratic Front (RDF) – T Sugathan, Ajayan Mannoor and Karivelloor Ramakrishnan – who were arrested last week. “This is a case of sheer violation of human rights. The police have imposed on the trio UAPA without adequate evidences. 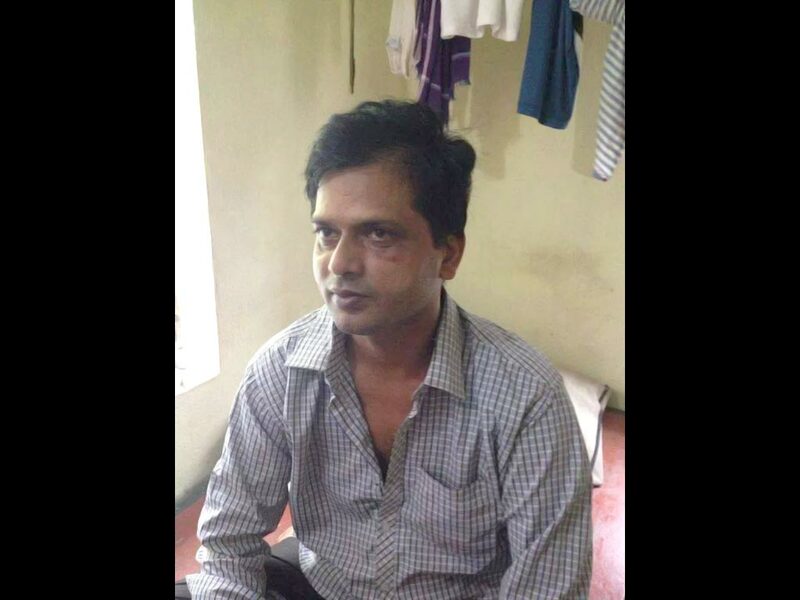 Maoist leader Sabyasachi Panda and former Maoist mediator during abductions Dandapani Mohanty, who are on hunger strike, were shifted from Berhampur circle jail to MKCG Medical College and Hospital in the city. According to Senior Superintendent of Berhampur circle jail, Raghunath Majhi, both had to be shifted to the Medical College Hospital as their condition deteriorated because of fasting. 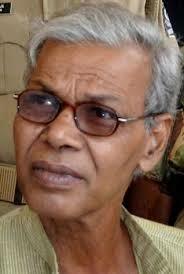 Sabyasachi had been shifted to the hospital on Sunday, while Dandapani was shifted on Monday. 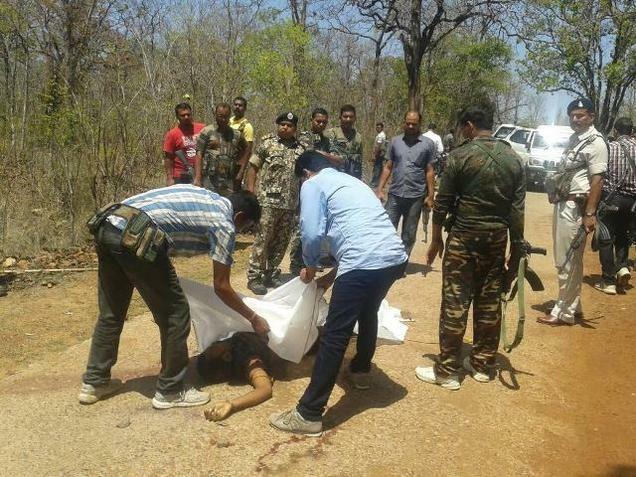 According to the physicians treating both these Maoists, their condition was out of danger. Armed police force had to be deployed to keep watch on these two persons under treatment in the hospital. Sabyasachi had started his hunger strike on April 22 to protest against his solitary confinement and alleged curbing of his basic rights. 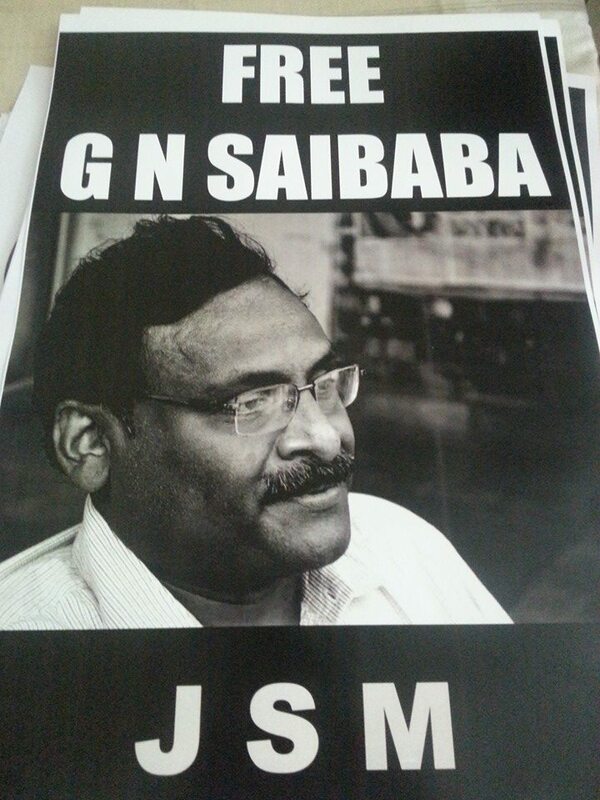 Earlier he had observed hunger strike for five days from March 31 on the same demands. KORAPUT: Maoist posters were found at various places across Narayanpatna block of the district on Monday. In the posters, the Maoists demanded end to the anti-Maoist ‘Operation Green Hunt’, exploitation of tribals by landlords and withdrawal of police deployment from different tribal pockets. 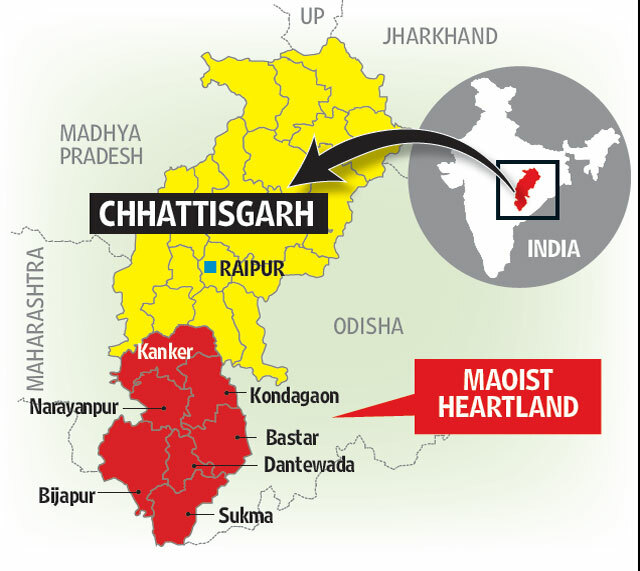 Sources said the Maoist outfits working in Narayanpatna, Bandhugam and bordering pockets of Odisha-Andhra Pradesh had started putting up the posters after the recent public meetings held by the police in the area. Inspector General of Police (south-western range) Yashwant Jethwa said combing operation has been intensified in the block after the posters were found. Besides, borders of the district have been sealed. 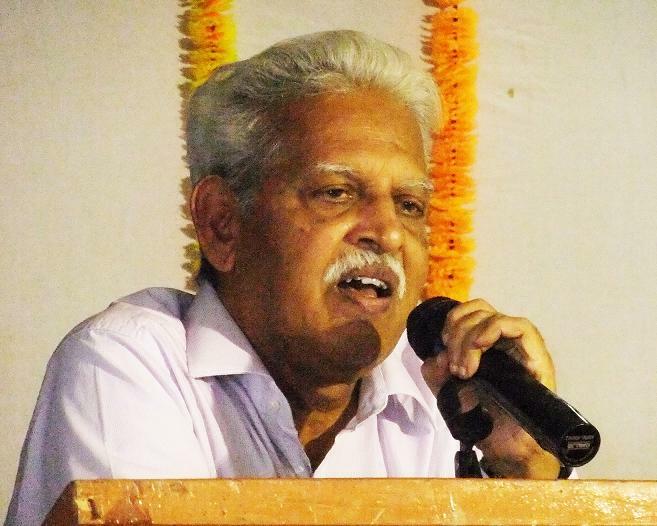 Nagpur: The Naxals have appealed to the masses in their strongholds of Central India’s hinterlands to observe ‘protest week’ between April 25 and May 1 against the land acquisition bill. The rebels have claimed that there would be violent opposition if government compels farmers to surrender land. 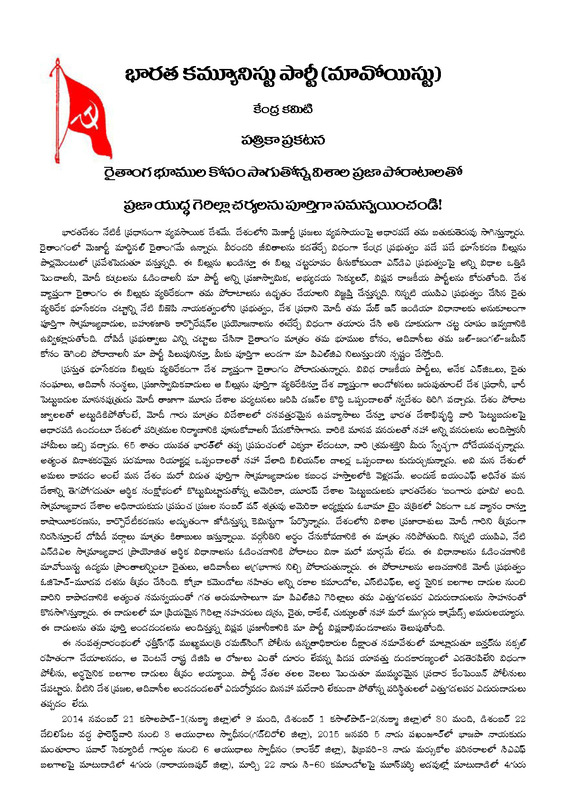 The communist Party of India (Maoist) has appealed for agitation issuing a press note. 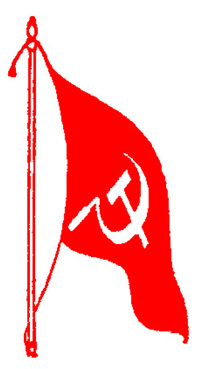 Dandakaranya special zonal committee (DKSZC), a potent wing of the CPI (Maoist) in Central India’ Gadchiroli and parts of Chhattisgarh, has urged the people to organize various forms of protests including road blockade and agitating at government offices against the land acquisition bill. The rebels, in their press release, have lambasted prime minister Narendra Modi and his government for trying to enforce an anti-peasant enactment to usurp their ancestral properties on the pretext of development. The guerrilla rebels have also stated that Modi is trying to hand over country’s resources to the foreign corporate companies under various schemes. Jamshedpur : The five day naxal bandh evoked an effective response in Kolhan on its second day today. The paramilitary forces had removed the posters during patrolling the area. Shops and business establishments were closed in Ghatshila and other townships under Ghatshila sub-division of East Singhbhum district since the morning. The operators of commercial vehicles, including the passenger carriers kept themselves away from the road, commercial organisations, including bank and ATM counters remained close.